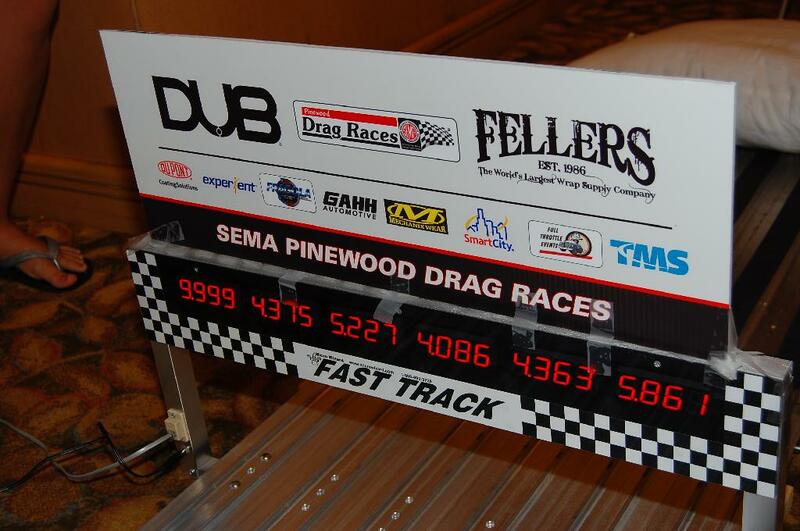 The first-ever SEMA Pinewood Drag Race sponsored by Fellers and DUB Publishing, was held July 25 during the SEMA Installation Banquet and Gala Fundraiser in Irvine, Calif. The benefactors are kids! SEMA combined a fun way to get SEMA members doing something they love, racing, and at the same time, give back to some important charities. All proceeds from the first SEMA Pinewood Drag Race are to be generously donated to Childhelp, a charity home for abused and at-risk kids (click here to donate); and the Victory Junction Gang, a camp developed by NASCAR racer Kyle Petty for kids with health-care needs (click here to donate). 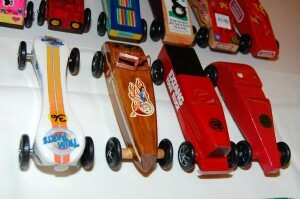 As you know, Pinewood derby racing has long been a part, for me a critical part of the Cub Scouts. 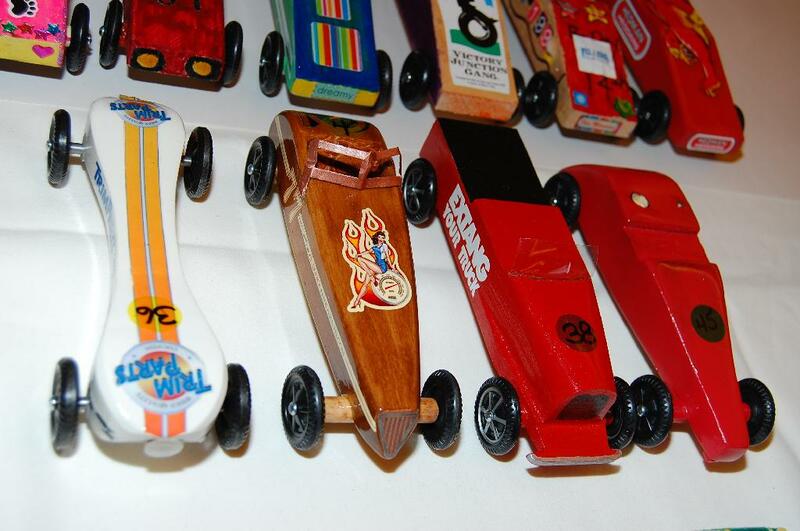 I remember building a car with my dad and racing against what seemed like a million cars… when I was just a kid. We had that car flying with, probably illegal, anti-seize compound used to lubricate my highly modified wheels. Through the first couple rounds, we did great. Then, when it really mattered, a volunteer, trying to help (I think) soaked my wheels in graphite, the normal lube of choice, and created a sticky mess. My car barely made it to the end of the track! SEMA made it easy to race. Two high-tech tracks were donated from the Light-Truck Accessory Alliance (LTAA), then, SEMA provided the kit needed and all the rules. All you had to do was build it! 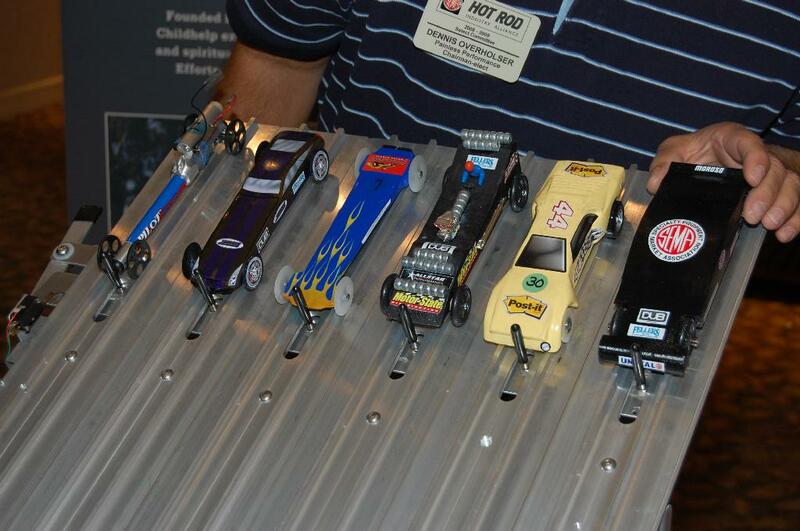 The kit included a 7-inch racecar and all the pieces needed to put together a complete Pinewood Drag Racer. The three classes of competition called for stock, modified and unlimited or you could say mild (basically no mods) to wild (unlimited mods!) depending on how much you wanted to push the envelope. The track was cooler then any track I had seen! Dig the finish line of this track! We never had a digital timer! Even cooler? You didn’t even have to attend the Gala Fundraiser to join the fun. You could build up your racer then send it to SEMA and expert “drivers” would send you down the track. 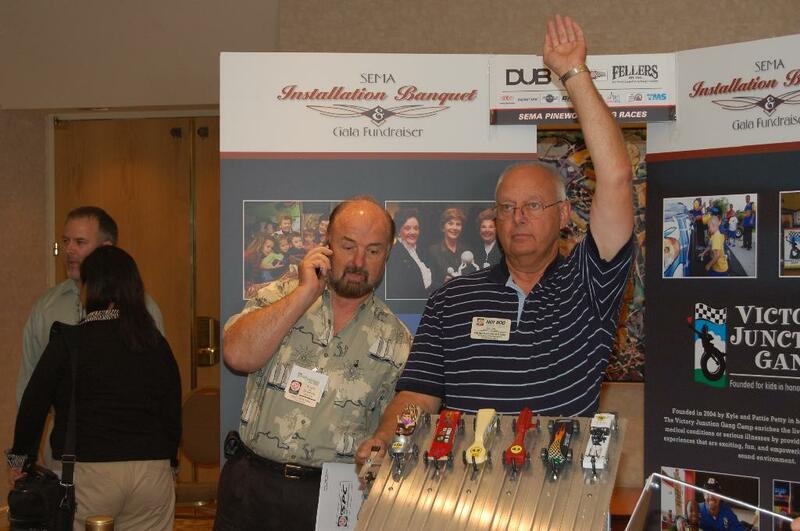 You can also get together with the SEMA gang and teams of industry people to build cars with kids from both charities. Another cool way to give back and help out kids in need. I didn’t make it to the race, but SEMA was kind enough to supply all these pictures and Franco Ganino, the VP or at Alliant Insurance Services Inc. sent over his recap. Thanks Franco! What a great event supporting these incredible charities. The Specialty Equipment Insurance Alliance car was fueled by the passion and spirit that motivates the SEIA team to serve SEMA members on avoiding risk and saving money on their commercial insurance. Knowing we were up against some of the greatest minds in the industry to compete against we first burned some sage to set the mojo straight on our pine tree which found its fate to become our race car. With the smell of fresh cut pine and the after scent of sage in the garage our imagination was running wild. Like an insurance contract, we read the rules inside and out to ensure Mike and his crew wouldn’t prevent us from being in the big show and weighing in at exactly 6 ounces it was clear that our transam racer was born the perfect weight for flight..On race day we joked about the feeling of jitters similar to what we feel like on a normal race day, but this time it was mixed with a child like exuberance (o/k I have to admit, real cars, toy cars, its the same spirit, regardless of the era the body is in or the car being raced). Having lead our first two heats and setting the track record for the stock class this little fire bird wanted the gold cup to match its golden wings. Unfortunately, hitting the finish line under 4 seconds consecutive times took its toll on our high flyer when striking the make shift sand box at the end of the track (aka: the pillow), forced the rear axle to dislodge from the car. Our excitement turned to nervous energy as our pit crew had no experience with this repair and only a short time before the final race. Cool, and Confident the car was made true and the final race was had and a solid second place was all we could hope for, yet left wondering what could have been done differently. Could we have taken the car to a shaman instead of using a Native American approach toward cleansing the car of its demons. Should we have taken the car to one of our dearest clients in Dan Gurney’s All American Racers to have it tested in their scale wind tunnel where the most famous birds of them all were hatched in the American Eagles or ask one of our other clients Dynatrac to work with our pit crew on tactical axle configurations. In the end we too have to take Ricky Bobby’s words to heart that, “if we ain’t first, we’re last”. Which is enough motivation in itself to pull out the band saw instead of the welder to support SEMA and these great charities and of course act like kids on the outside again, but if for only a day! Then Margaret Testuccia froma SEMA’s Exhibitor Service Specialist had this to say about their race. ‘With SEMA’s Big Daddy and his Girlz busy working the pits, Lucky Abbi from Victory Junction Gang stepped up to the track and ran ‘Pink’. Abby’s excitement and furious cheers brought the crowd to their feet and our underweight racer into third place, unlimited division. Look out guys! Big Daddy Tim and the Girlz — Margaret, Karen, Susan, Sol, Nina, Denise ,Cher, Arlene, Helen, Wendy will be back next year ! After the race the two 48-foot racetracks were donated to the two charities, Childhelp and Victory Junction; so the kids (big and small, apparently!) will be able to enjoy them for years to come. The racers were also encourage to donate their cars as well. All the pictures I have from the race are loaded in the Picture Gallery. Any more? I’d love to hear from more of the racers. Thanks to everyone from SEMA for helping with this story. Here’s the list of winners. Count on seeing MyRideisMe.com on this list next year!